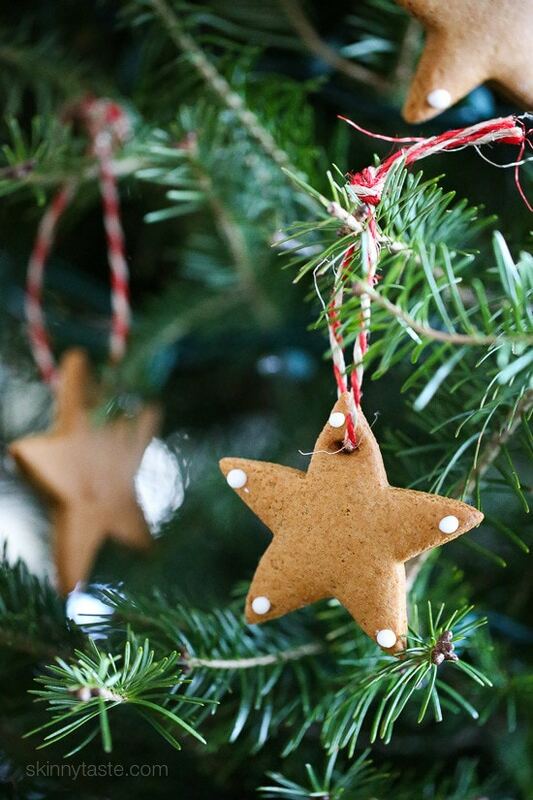 Make Christmas tree ornaments out of gingerbread cookies – so fun to make with the kids! This weekend we bought our Christmas tree and I thought now that Madison is getting a little older (she’s 5) it would be fun to spend Sunday making homemade ornaments. We blasted Christmas music in the background, had lots of fun and the whole house smelled like gingerbread. 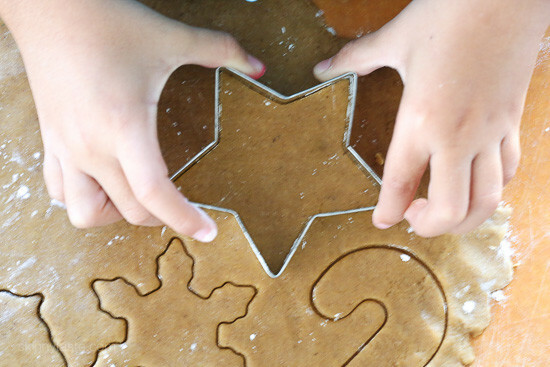 This is such a fun project to make with the family, all you need is some cookie cutters (I chose stars, Madison used all different shapes), some twine and I used the tip of the piping bag to cut the holes in the dough. My older daughter Karina even wanted to help so it became a family affair, with lots of laughs, and a great way to get everyone off their iPads and computers. My girlfriend is a Girl Scout leader and plans on doing this with her girls. 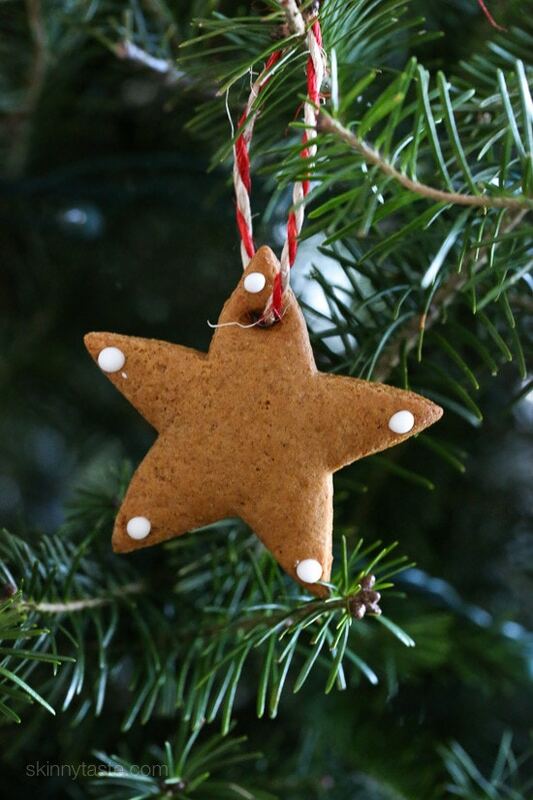 I used my basic gingerbread cookie recipe which you can find here, which made about 60 stars. 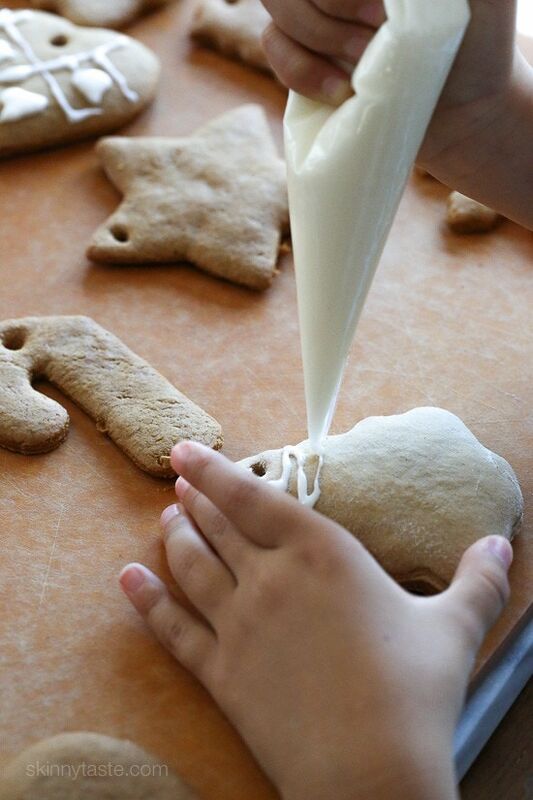 The amount will vary depending on the size of your cookie cutters. Madison hugged me so hard when we were all done and said it was the Best. Day. Ever! A Sunday well spent, making memories that will last forever. Here’s the basic steps, have fun! 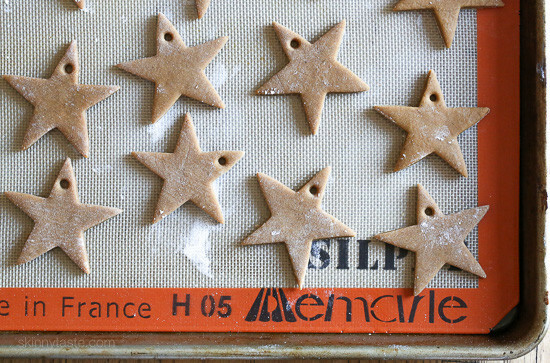 You can use any gingerbread dough recipe you want, but I went with my basic recipe. For the icing, you won’t need food coloring unless you want colored icing, and you may want to double it depending on how you design them. Preheat the oven to 350°F. Generously dust the surface of your working area with flour before rolling out the dough. Work with one ball of dough at a time, keep the other refrigerated while you do so. 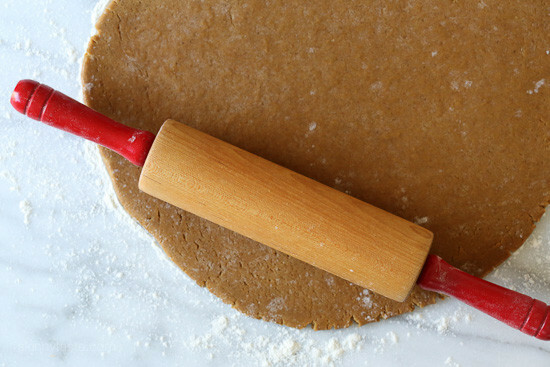 Roll the dough out to 1/8-inch thickness, sprinkle a little flour on top of the dough if it’s sticky. 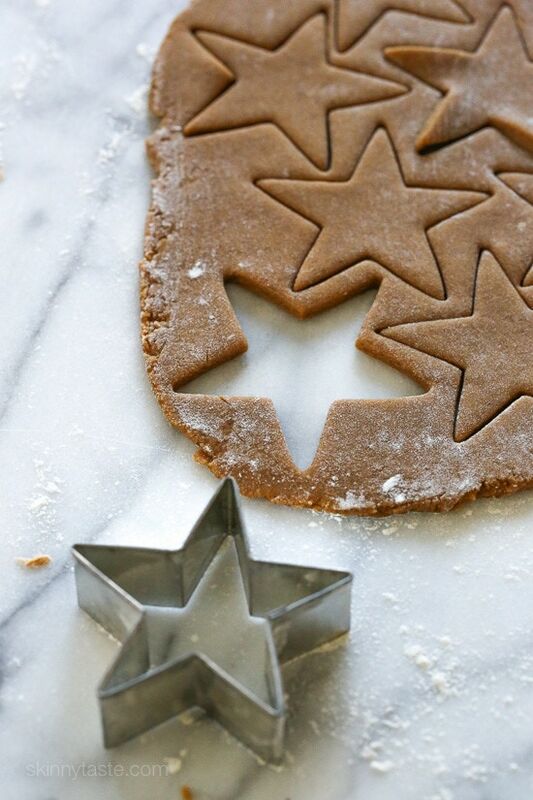 Place flour on the cookie cutters so they don’t stick and cut the shapes. Use a round piping tip to cut the holes. 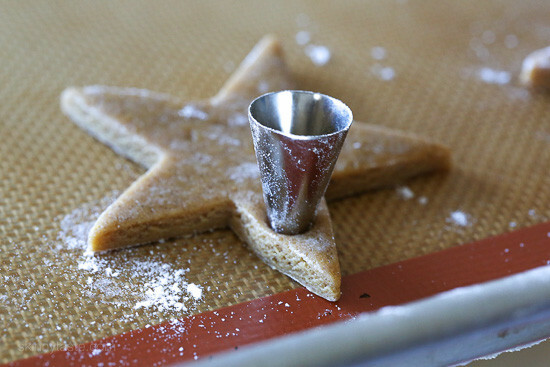 Place the cookies 1 or 2 inches apart on a silpat-lined baking sheet. Bake 10-12 minutes. Let them cool, then pipe the designs. Let it dry completely before hanging. I found it easier to tie the strings after I piped it. I love this!!! What a great idea and great activity to do with the kids! These are so cute! We don't have any oven racks right now (and no money at the moment to replace them) so we can't bake anything at home. So disappointing. Oh, well. Thanks for posting this! Love this! 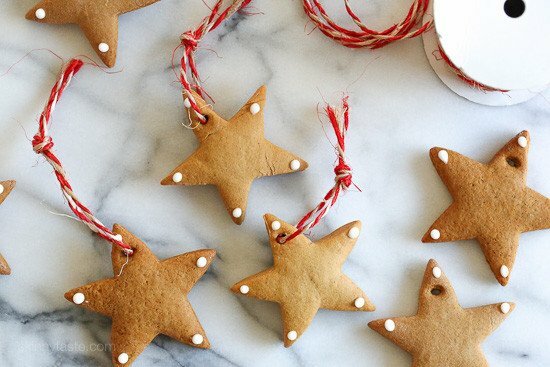 I have done something similar before with an actual ornament dough recipe. 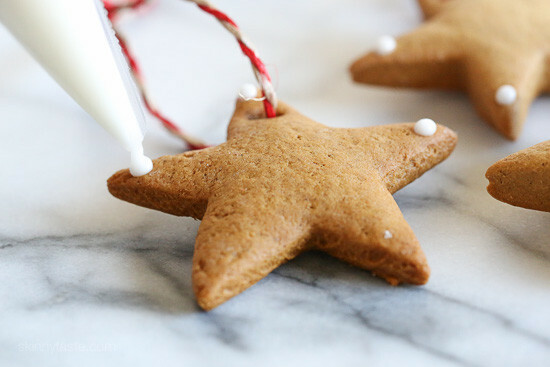 I didn't know you could just use a simple gingerbread cookie dough recipe and hang up the ornaments. 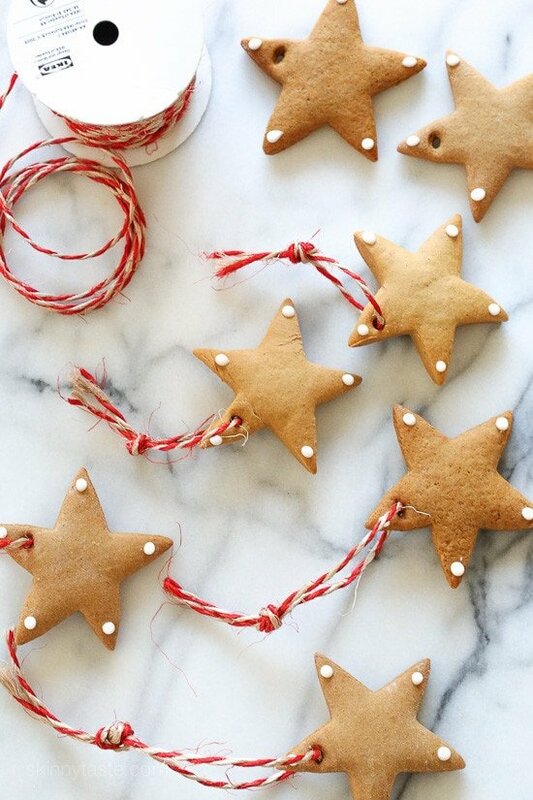 I bet the house would smell lovely due to the baking of the gingerbread! Such a cute idea! How long do they last and does it attract ants eventually?